*Unless you're fluent in the Hawaiian language, I offer you a Skeleton Key for translation which you can find HERE. Christmas, 2004....do you remember where you were? You say you were on a Maui beach? Well, maybe you spotted our illustrious chrome-domed Mayor rubbing sunscreen on his noggin. And who was that blindingly white, white guy beached beside him? It's none other than New Orleans CIO, Greg Meffert!!! 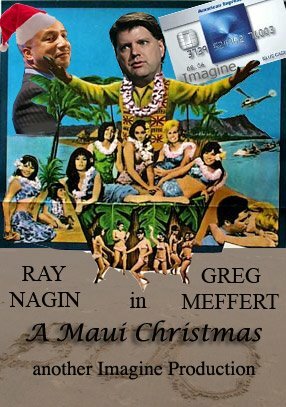 Two buds spending Christmas in Hawaii....nothing wrong with that. But wait, what's that? You overheard a conversation between them? After sipping his Pina Colada, Nagin asked Meffert, "Who's paying for all this?" Meffert replies, "He mea iki....hakuna matata. Don't ask so many questions Ray Ray....and if anyone asks you about it just say, 'Pehea ho`i'". I can't IMAGINE who could have paid for that trip. Surely they weren't so Lôlô that they had a city sub-contractor pay for it. I mean....couldn't that be traced? No way would they be that kâpulu! But then again, Meffert loves to hô`oio....maybe he was kâpulu enough to leave a trail. This Howie has some Maha`oi alright. So come on Ray....explain this one...`Oia ana! Secret Owner/Silent Partner in Table One Restaurant on Magazine? Ray Nagin through AFO Investment which owns a secret interest in Magzazine Restaurant Group, whose owners of record include David White and Hicham Kodour. Just ask Hicham's ex wife. ..
AFO Investments = All For One, that is All for Nagin. . .
Nagin isn't the only High Fallutin City Hall official who found time to open a restaurant right after Katrina: His Director of Housing Alberta Pate opened Alberta's further up Magazine, pulling a fast one on neighbors who before the storm opposed her plans to open the high priced bistro because of zoning problems and insufficient parking. While everyone was away, Alberta pulled a fast one and got the place open before most of her neighbors had a chance to return and notice. While she was spending her time on the public payroll getting in the restaurant business, no one was thinking about the housing crisis the city was facing, and it appears no one is now. Blackcat Productions? That's the outfit through which a major recording industry figure funneled hundreds of thousands of dollars into Nagin's 2002 campaign, skirting the campaign finance laws. Nagin's brother in law convinced this MASTER-Ful celebrity to wash the money so it would look like Nagin put up some of his own cash to run, but it really was some less than pristine proceeds through this well known celebrity who has relations in big trouble with the law in JP. And don't forget, Nagin tried to get a minority set aside rent a car business at the airport during the Mark Morial administration, just months before Nagin announced his run for mayor. Sounds like a scenic, fun time for all involved. But you seem to be missing the main issue here: Mitch Landrieu renovated his office, has weird hair and is related to his sister and his father. Is it just me or does anyone else think that this trip was a classic example of a kickback and, therefore, ILLEGAL!!! Why isn't the New Orleans District Attorney's office investigating this company and the mayor? "Ha'ina 'ia mai ana ka puana": one of my favorite Warren Zevon lyrics. Next thing you know, Nagin will be axing for lawyers, guns, and money. Nagin will *need* lawyers, guns and money. Damabal, you da man. Aloha from Hawai'i, albeit a cubicle on O'ahu rather than the beach on Maui! Maika'i no, E Dambala! E ola mau ka 'olelo Hawai'i! In fact, your Hawaiian is so good that it fooled another prominent N.O. blogger into thinking you were me; he couldn't figure out who else would be writing about N.O. who knew any Hawaiian. In fact I am a 15-year N.O. exile who ended up out here where there's a history of monarchy, unusual everyday food items, crappy public schools, underpaid cops -- all the comforts of home! Is there a way we could form a "sister city" relationship between these two unusual societies? Spam musubi at Jazz Fest someday? Hiki....I want to see a second line of beautiful Polynesian playaz Hula'ing behind a ukulele led march through the fairgrounds. Ironically enough...this actually happened in the Quarter. When Arthur Rodgers used to be in charge of the Halloween gay circuit party, he would always fly in this amazing Hawaiian dance group....I mean amazing stuff to watch this group. They led a parade through the quarter from Rodger's house to the Gov. Nichol's street wharf where the party was being held. Tell me this....are there Zombies in Hawaiian mythology? You may want to check on who with Imagine has a suite at the Dome for the Saints games. It either belongs to Imagine or the Mayor's office - they all use it and were there at the game. Is our tax money paying for this?? ?